There are times when off-the shelf bearings or “it will be done in weeks” just won’t do. While most of our customers come to Bunting Bearings for our outstanding standard bearings and casting capabilities, there are those that need custom machining and quicker turnaround times. At Bunting Bearings neither one of these challenges is a problem! If you need custom bearings or machined products, then Bunting Bearings is the place for you. We are proud to offer our customers comprehensive on-site custom machining facilities. Our state-of-the-art and innovative facilities produce bearings and components that meet or exceed the highest and toughest industry standards. 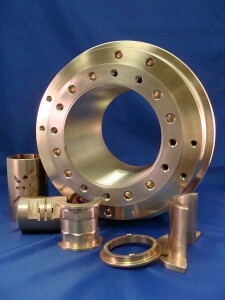 Thanks to Bunting’s skilled craftsmen and our computerized numerical controlled (CNC) machining lathes, mills, and other ancillary equipment, we can produce components from ¼” up to 20” in diameter. In addition, our design and engineering group are here to take you through the design of your custom bearings and components at no extra cost! The key to everything we do at Bunting Bearings, whether it is our custom capabilities or our new Bunting Express service, is knowing that you are getting unmatched and industry-leading customer service and quality, plus the knowledge of over 100 years of experience today!